Vern Burkhardt (VB): You say in Innovation Tournaments, "Rigor transformed the management of production in the twentieth century. We believe a similar rigor can transform the management of innovation in the twenty-first century." Does this suggest that a lot of what's written about creativity and innovation misses the mark because it doesn't propose a rigorous approach? Dr. Christian Terwiesch: If innovation, creativity, and ideas are the source of competitive advantage, we should professionally manage them. As we show in Innovation Tournaments, you can professionally manage your ideas – just like you professionally manage your supply chain or your cash flows. And, that indeed provides a contrast to the less structured approaches of most previously written books. VB: You use the term "creative magic" when referring to the level of an individual innovation project. What is the magic you are referring to? Christian Terwiesch: Most people would initially associate the word "creative magic" with flying sparks, light bulbs, going wild – this type of stuff. We are referring to something else. The companies we worked with were looking for tools and methods, not for witchcraft and wizardry. So our approach is one of structure and process. Initially, the words process and innovation seem in conflict with each other. Innovation means doing something new. Process means doing something similar over and over. You resolve this conflict by abstracting from the specific innovation at hand. Instead, you think of an opportunity – the seed of an innovation. And through this process, the "magic" becomes something that you can learn and replicate. VB: What is an opportunity? Christian Terwiesch: Allow me to define our view of an innovation first. I will then circle back to the opportunity. For us, an innovation is a new match between a need and a solution so that value is created. The novelty can be in the solution such as a new molecule. It can be in the need such as you did not know that you had a need to twitter every day. Or in the match – for example, match a disk drive and the need for portable digital music to get the iPod. We want to be broad about how to define value. It could be a money-based definition, or one that is more altruistic. Initially, you don't know if value will be created. Value creation remains a hypothesis – a dream – and there exists significant uncertainties about the true value that will be realized. So we speak of an opportunity as the seed of an innovation. VB: "Exceptional opportunities – those that will account for the majority of profits – are not marginal; they are clearly superior." If so, why is the track record of innovation success not high, even for what you call "horizon 1" opportunities? Christian Terwiesch: You raise a good point – the track record for many companies is far from being stellar. Our research shows that there is no clear link between how much companies spend on R&D and how much they grow or make money. Apple spends less on R&D than the industry average, but most of us would call them innovative. But, I want to caution you to not equate the failure of individual opportunities with the failure of an innovation process. As we explain in the book, to make an innovation tournament successful you need to process many opportunities. And this means that you will kill most of the opportunities. VCs, drug development, movie companies, and even casting shows such as American Idol all consider many opportunities to get to a select few. Thus, good innovation means many failed opportunities. VB: As you point out, companies that are early in attempting to commercialize new-category innovations are often a few years ahead and often not the companies that are the first to be successful in introducing the products into the mainstream marketplace. Equally interesting is that the companies which become leaders during the peak growth period of the product life cycle are often companies that were not heavily involved in R&D during the early commercial attempts or first in bringing to market a product in a new category. If you were the owner of most companies, would you be wary of leading edge research expenditures? Christian Terwiesch: Every company needs to determine how it wants to succeed in the market place. This is what strategy is about. Only once you have determined your strategy, should you start thinking about how you allocate resources to innovations across the three horizons. Sometimes I see consultants advocate specific resource allocations across the three horizons of growth as "optimal," for example; spend 60% on horizon 1 innovations and 10% on new-category innovations. Unfortunately, it is not as simple as this. Setting your innovation portfolio is a dynamic and iterative process that needs to be customized to every company, and it needs to be revisited on a regular basis. What is good for Dell might not work for Apple. Having said this, I think it is fair to say that all too often, we get carried away by the dreams associated with new-category – Horizon 3 – innovations. VB: What's has been called "disruptive innovation" can occur in Horizon 2 and 3, but is it highly unlikely to occur in Horizon 1 opportunities? Christian Terwiesch: Yes, I think this is fair to say. For a technology to be disruptive, it has to be something that is different from what the organization presently uses. And that would make it at the outset a Horizon 2 or 3 opportunity. VB: Does it require a lot of sophistication for a company to create a "robust innovation portfolio?" Christian Terwiesch: Nothing that we outline in the book is sophisticated to the extent that theoretical physics or brain surgery is sophisticated. We outline a set of tools and methods. Robust portfolios build on a technique known as "scenario planning." Since we can't predict the future, we should try to at least be prepared for the potential outcomes that might be associated with the future. VB: You say innovation tournaments are like American Idol and the way architects and designers compete to have their concepts accepted over others that have been submitted. In your experience, what is it about innovation tournaments which attract people to make submissions? Is it more often the inherent motivation many have to make a contribution rather than seeking reward and recognition? Christian Terwiesch: Yes, you are absolutely right. It is not always about economic rewards. People get excited about innovation tournaments, because they perceive the underlying process as fair. And so, everybody in an organization can participate. But then, it is the ideas that have to stand on their own feet. When the ideas are rated, nobody knows if it was the CEO's idea or the idea of the summer intern. And once you take the politics out, innovation becomes real fun. VB: Perhaps this question is even more interesting when applied to independent inventors who, as you point out, lose money on average albeit a tiny fraction are able to successfully identify a match between an unmet need and a new solution. Most independent inventors are by nature high risk gamblers? Christian Terwiesch: That is the only rational explanation for the behavior that we observe. People like to gamble and get excited about the large potential upsides. This possibility of day dreaming along with the process of inventing has real utility to inventors. And I see nothing wrong in this. I have always advised our students to do what they really want to do. Economic theory doesn't postulate that we are money maximizers – we maximize utility. VB: Is the innovation tournament process an ideal way to overcome the ineffectiveness of the many other and often traditional ways organizations try to encourage employees to contribute their creative ideas? Christian Terwiesch: As an academic, I am always hesitant to claim that something is ideal. But it is certainly a good way. The fact that nature "innovates" this way should encourage us as well. The Darwinian process of creating variety and then have the fittest survive follows the same logic as the innovation tournament. VB: "Indeed, tournaments are the second-best way to innovate. A better approach is innovation based on rigorously tested scientific theories." Does this mean that innovation tournaments are not always the best way to innovate? Christian Terwiesch: To determine at what speed I should be driving if I want to get from my house to the airport 10 miles away in 20 minutes, I don't need to run a tournament. A simple formula does the job. So, philosophically, innovation tournaments are the second-best way. But for all innovative management problems that I have encountered, there was no formula that would give me the result. Then we are back to trial-and-error. And the best way to organize trial and error is the innovation tournament. VB: When discussing the eliminating rounds to screen opportunities in an innovation tournament you say the typical funnel metaphor doesn't work; "It's more of a filter than a funnel." Is "smart screening" a major challenge in the process in order to avoid having the successful ones being predominantly incremental innovations, or is there a greater risk of people judging the opportunities being more attracted to peripheral ones? Christian Terwiesch: Nobody likes to kill ideas. This often has a political dimension to it – those who came up with the idea are emotionally attached to it. But if you are never killing ideas, you probably are not generating enough of them. VB: You also advise that "…in almost all settings that we have encountered, the mouth of the funnel should be widened… You will almost certainly benefit if you just do it." Quantity and quality are directly related? Christian Terwiesch: Great question – in our research we find that typically you can create more ideas without decreasing the average quality. In other words, you don't reach the point where you have fished all good ideas out of the pond. Now, if the average quality of the ideas that you keep on generating remains the same, the quality of the best idea is getting better with quantity. Being the fastest runner in a village with fifty people is less of an accomplishment than being the fastest runner in New York. VB: One of your many interesting points is that in addition to increasing the average quality and quantity of opportunities produced, striving for a wide variance in the quality of identified opportunities will result in more exceptional opportunities. This seems counterintuitive – how does it work? Christian Terwiesch: In most management settings, variance is the enemy. As a production person, I prefer to have 10 consistently good production runs as opposed to one perfect run and then 9 runs of scrap. In production, every unit of output matters. However, things are different when you are innovating. One good idea can be enough, and so you can afford 1,000 bad ones for just this one good idea. VB: It seems many who write about innovation assume anyone can be highly innovative, but you indicate the opposite – people differ substantially in their ability to identify exceptional opportunities. Would reading and applying the lessons in Innovation Tournaments enable more people to come up with better opportunities even if not exceptional ones? Christian Terwiesch: I know; this result is politically very incorrect. We all like the concept that everybody is good at creating ideas. But this is just not true – just as not all of us are good singers or good runners. Having said this, just like you can practice and improve your singing or running skills, so can you improve your innovation skills. And our book gives you the training plan for that. VB: You point out that if you are operating in an industry where the minimum required scale for innovation is low, you must sense opportunities externally. In terms of timing, you say that "sensing is most beneficial when the signal that you are sensing is still weak. And for that, you have to listen very carefully." Is this one of the more creative parts of innovation? Christian Terwiesch: It is certainly one of the hardest parts. Accepting that in most settings the vast majority of the great minds on a topic sit outside your firm is very hard for many top companies. But once you get over the ego, you can ask yourself "what can I do to leverage their brains, even if they are not my employees?" And that gets us right into the idea of open innovation. VB: Do you foresee more companies recognizing the benefits of open innovation? Christian Terwiesch: Yes, I have no doubts that we are just at the beginning of that journey. In most industries, new products nowadays require deep levels of expertise in very narrow areas. No company can afford to have specialists for everything on their payroll. VB: Would you talk about your Darwinator software? I understand that this software can be downloaded for free? Christian Terwiesch: Yes, you can create and run your own tournaments at this website for no charge. It's probably not very business savvy from our end – we have no business model for the site to generate revenue. We developed this for our own use and so we felt that we should have as many people as possible benefit from the tool. VB: Do you offer consulting services about how to run innovation tournaments? Christian Terwiesch: We regularly work with companies and run 1-day or 2-day innovation tournaments with them. We bring our experience of having gone through this process dozens of times. And the companies provide their human capital and their domain knowledge. Every time I go through this process, I am amazed by how creative people get if you equip them with the right tools. VB: In the preface to Innovation Tournaments you say, "Some of the material in this book is challenging analytically." You must have spent a lot of time making this material understandable to the reader, because it is. Did you have a diverse group of people test your manuscript to check that it was clear without needing to "dumb down" the content? Christian Terwiesch: We wrote the book three times. Initially, we spoke too much as academics. I guess my co-author, Karl Ulrich, and I were more writing for each other when we did the first version of the book. But, if you need a lot of math to express yourself, you probably need to spend some more time reflecting about what it really is that you want to say. We tested the book with publishers and practitioners and we sought the help of a professional editor. And the end product was a book that was written for our readers in practice, not our colleagues in academia. VB: You say you and your co-author, Karl Ulrich, "have been innovators trapped in the bodies of operations management professors." Which is your greater passion – innovation or process management? Christian Terwiesch: I have to confess that I am and always will be a process guy. I have my to-do lists, my routines, and I try to optimize everything. VB: You have co-authored two books. Is co-authoring a difficult process? Christian Terwiesch: No, not if you have Gerard Cachon or Karl Ulrich as a co-author. The three of us are also avid cyclists and we probably have discussed most our ideas underlying the books on bike rides instead of conference rooms. VB: What are some of the remaining questions to be answered about open and closed innovation tournaments? Christian Terwiesch: I am working right now with non-profit organizations to help them become more innovative. After all, there exist bigger problems than coming out with a new toothbrush or a new movie. The value associated with those innovations cannot be measured in dollars or Euros. Innovation is not just about getting rich – it is about making this world a better place. VB: Do you have any other advice for our IdeaConnection readers? Christian Terwiesch: My first advice is to follow your passions. Don't create a new venture just because you think it will make you rich. Second, keep in mind that as smart as you might be, there is somebody out there who has solved similar problems before – find them and learn from them instead of reinventing the wheel. And third, ride your bike to work instead of sitting in an ugly SUV. It is good for you. It is fun, saves a lot of money, and makes this world a better place. Co-authors Dr. Christian Terwiesch and Dr. Karl Ulrich advise that an opportunity is an innovation in embryonic form. It's merely a hypothesis about how value can be created and therefore whether it is worth pursuing. So the goal is to identify many opportunities and then select the best ones to pursue. "Ultimately, there's only one way to learn to swim – you have to get wet…The same holds for the first step along the path to innovation excellence. Eventually, instead of discussing theories, paying consultants, or reading more books, you have to get started." But as we learned in our interview with Christian Terwiesch help is available for running our first innovation tournament if we are still reluctant to get wet on our own. Dr. Christian Terwiesch holds a Master's degree in Business Information Technology from the University of Mannheim, Germany (1993), and a Ph.D. in Management from INSEAD in Fontainebleau, France (1997). He is a Professor of Operations and Information Management at The Wharton School of the University of Pennsylvania. He also is the Academic Director of the Strategic R&D Management Program, a one-week executive education program offered by a Wharton-INSEAD alliance focusing on R&D and innovation. Previously, from 2004 to 2005 Christian Terwiesch was Visiting Professor of Technology and Operations Management at INSEAD, from 1998 to 2004 Assistant Professor of Operations and Information Management at The Wharton School, and during 1997 and 1998 Project Scientist/Post Doctoral Researcher at the Graduate School of International Relations and Pacific Studies, University of California San Diego campus. 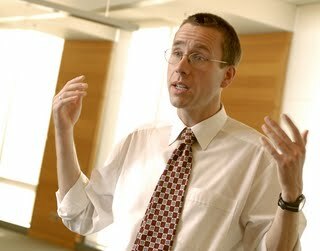 Christian Terwiesch's research on operations management and on R&D and innovation management appears in many of the leading academic journals, including Management Science, Operations Research, Marketing Science, and Organization Science. He has written for practitioner journals including Journal of Product Innovation Management and California Management Review. Dr. Terwiesch has also had a chapter titled "Product Development and Concurrent Engineering" published in Encyclopedia of Production and Manufacturing Management (2000), "Product Development as a Problem Solving Process" in Blackwell Handbook on Technology and Innovation Management (2008), and "Coordination in Product Development" in Handbook on Product Development (2007). He is also active on various editorial boards for journals including Management Science and Production and Operations Management. Professor Terwiesch is the co-author with Karl Ulrich of Innovation Tournaments: Creating and Selecting Exceptional Opportunities (2008), and with Gerard Cachon of Matching Supply with Demand: An Introduction to Operations Management (1st edition 2005, 2nd edition 2008). The 1st edition of Matching Supply with Demand has been translated into Mandarin and Korean.